I have a very large enclosure system for the five cats – it keeps them safe (99.9% of my reason for keeping them indoors or in an enclosure, the other 0.1% encompasses the idea of keeping the wildlife safe and keeping the neighbours happy). It comprises some 12 smallish enclosures (about 2 meters square) and a lot of walkways that run through the garden – 220 metres worth (about 200 yards give or take), so the cats have almost a quarter of a kilometer of running and exploring through the garden. Eventually I’ll put up the page on the enclosures. 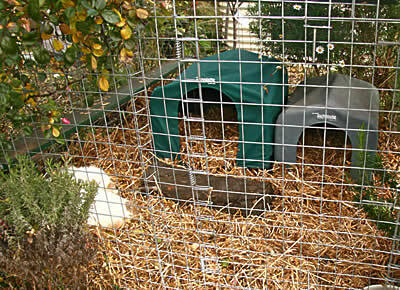 But – every year I pack out one of the enclosures with hay – the cats love it to pieces. They bury themselves in the hay – keeps them warm in winter and cool in summer. Strangely, it never seems to stick to their fur. The whole hay adventure has developed further this year. I picked one of the larger enclosures and packed it out with hay (pictures below), which the cats loved, and put in a new kennel for them, but a week or so later I completely reconfigured how the cats exit the house. Formerly they had come out of the cat door, then used walkways to climb and up over the car port roof before descending into the garden enclosure system proper. I’ve been meaning to change this system for about 2 years now. Hawthorn was starting to grow over the car port roof and through the enclosures (and hawthorn is spiky and dangerous), and it was a tremendous bother to try and cut it back, and I didn’t like the fact that if one of the cats was sick or injured atop the car port roof I couldn’t get to them without great drama. Plus the dogs next door could see them up there and kicked up a kerfuffle. Constantly. So I needed to alter the exit system. One day last week I spent twelve hours in the freezing cold moving bits of enclosure about, and cutting and snipping and bending wire (my hands and forearms ended up with a mass of cuts and bruises). The cats, locked inside, gave vociferous encouragement from the scullery window. 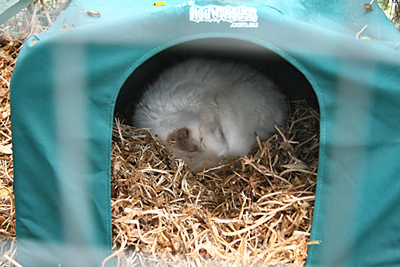 Finally I had it done and the cats had a new adventure – moving from the house, into the carport itself, and then they had a long stretch of walkway right through the centre of a haystack! They loved it to pieces! The cats just adore it. All five of them can spend hours in there engaged in some mystical communication with the hay. Now, dare I actually use the hay in the garden? 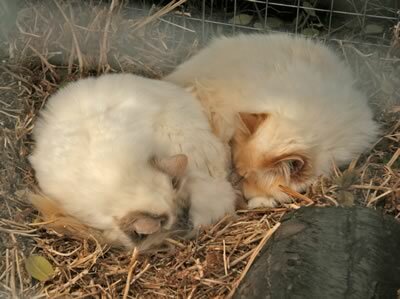 Here are a couple of shots of two of the cats, Cromwell and Jack, enjoying the newly laid hay in one of the enclosures. A broad shot of the enclosure, showing all the hay and two dog kennels I have in there for them. Next post Why all this gardening, and preserving, and mumbo-jumbo about self-sufficiency? That’s a great idea! What is it with animals and hay? Our dogs love running through the garden and throwing hay all over the place, and I swear our rabbits would choose sitting in some hay over lying on fresh green grass! LOL Joy. I just found a stray cat trying to get into the Hay Haven! Aww, they look so cute all curled up like that. I only have one cat to keep me company up here, and she can be rather ferocious at times. Still, a cute cat is a cute cat, and cute moments make up for all the others, I think. We plan on building outdoor cat cages for our two felines (Aramir and Chibi) Aramir is currently afraid of outside…but his mother Chibi would much rather be outside than in. I’m curious, Are Jack and Crom Birmans or Himalayans? (Or Ragdolls?). We’ve had about 7 pairs of Birmans throughout my life and they are the sweetest most insane cats I’ve ever met. They are Birmans, and are, indeed, amazingly sweet. I am not sure about insane – but insanely stupid I’d go for! LOL They really don’t come packaged with brains.